Can a 60-year-old drug cure obesity? Betahistine was once used to combat vertigo. Now it promises to help people lose weight, Business 2.0 reports. (Business 2.0 Magazine) -- With more than 300 million obese people in the world, it's no surprise that prescription weight-loss drugs alone are a $600 million market -- or that those drugs rarely work well. Some, like Xenical and Meridia, also have significant side effects, such as raised blood pressure. But an Israeli physician may have stumbled on a pill that treats obesity without side effects -- one that's been right under our noses for more than 60 years. Nir Barak, a Tel Aviv-based nutrition expert, discovered that Betahistine stops cravings for fatty foods. After learning that blocking the brain's histamine-1 receptor causes weight gain, Tel Aviv-based nutrition expert Nir Barak went hunting for a drug that would stimulate that receptor. He found Betahistine, which has been used to treat vertigo since the 1940s. Betahistine was pulled off the U.S. market in 1970 when the FDA began scrutinizing drugs more rigorously and demanded a new round of clinical trials. Betahistine's manufacturer, Unimed, never complied. A generic version is still sold in Europe, but the compound is no longer under patent protection in the United States. When Barak discovered there had been no inherent issue with the drug's safety, he knew he'd hit the jackpot. So did Bio-Light Israel Life Science Investments, which has funded all clinical development trials for Barak's new company, Obecure. Barak got weight-loss guru Robert Kushner to conduct a double-blind clinical trial. Results haven't yet been finalized, but Kushner says participants lost up to 12 percent of their body weight. "They were telling me, 'It wasn't hard. I wasn't thinking about food. I was content,'" Kushner says. "And there were no side effects to speak of." Stimulating the histamine-1 receptor appears to reduce the craving not only for food in general but for fatty foods in particular. 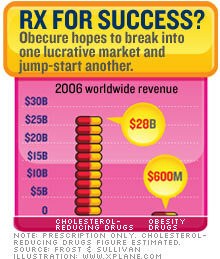 Less fat usually means less cholesterol, so Obecure is also targeting the $28 billion market for cholesterol-reducing drugs like Lipitor. "I can't think of a better time in history to have such a product out," says Kathryn Harrigan, a professor at Columbia Business School. By finding a new use for an old drug, Obecure is following a tried-and-true formula. "We frequently see a drug shifting its indication once it's been put to use," Barak says. Betahistine may soon become the most famous example.